On Tuesday a French Communist Party (PCF) delegation coming from the Val d’Oise province visited hunger strikers in Strasbourg. On 17 December a group of 14 people consisting of academics, politicians, journalists and activists started an indefinite hunger strike. They are receiving visitors from all over Europe. The activists are continuing their fast despite a number of health problems. Kurdish people and their friends in Europe keep visiting the hunger strikers since the beginning of the action. Alvaro Pasqual on behalf of the delegation, expressed solidarity and support for the struggle of the Kurdish people. Reiterating that the French Communist Party side with Kurdish people, Paqual said that isolation against Kurdish People's Leader Öcalan is is a crime against humanity and reminded that Turkey is among the signatories of the Human Rights Universal Declaration. A declaration, he added, they are violating. Pasqual also said that the PCF support the activists’ demands and will do their best to make sure they are answered to. Jean-Pierre Hennebelle, also from the PCF, said that this action was important and meaningful to them. Stressing that French and European media have not paid any attention to the hunger strike, Hennebelle said that this has to do with the commercial relations between Turkey and France. Hennebelle said that the PCF has been working since the first day of the protest to try and break the media silence. KCDK-E co-chair Yüksel Koç, one of the hunger strikers stated that they were happy to receive visits and that these visits were bringing them morale. Noting that despite their morale levels, their health conditions are getting worse and worse, Koç added that this action will continue until isolation against the Kurdish People's Leader is lifted. Yüksel Koç stated that this isolation is imposed to all peoples who want to live in freedom and peace in the Middle East, especially the Kurdish people. Expressing that the action is also aimed at activating people's conscience, Yüksel Koç called on all people with conscience to react against the crimes of humanity committed by the Turkish state and reiterated that the action will continue until their demand is answered to. Hunger striker Kerem Solhan asked the visitors whether they visited Kurdistan. The delegation said that they had not visited Kurdistan to which Solhan invited them to go and be their guests. 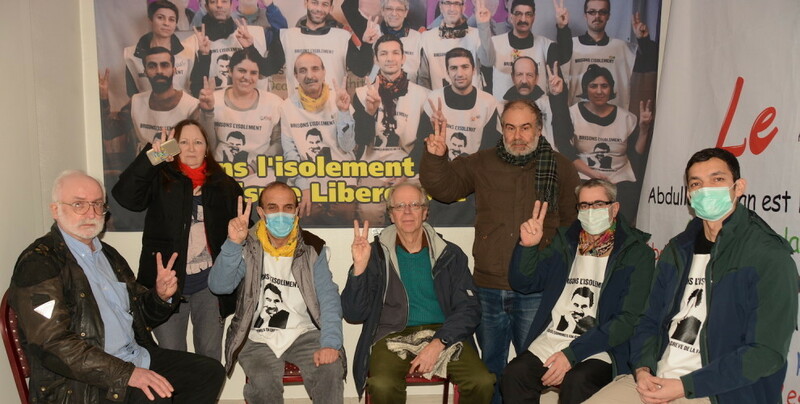 Solhan said that they are on hunger strike for 58 days in the heart of France and added that the silence of the French government was unacceptable. Kerem Solhan, who called on the French people to make their voices heard and stated that they were determined in their actions and that they would break the isolation in spite of all silence. Solhan ended his remarks by saying that they were willing to die in order to achieve success in their actions and said that Kurdish people is writing yet another historic page while for France this would be a shameful page, should any of the hunger strikers lose his life.